Location of the land parcel at Martin Place. 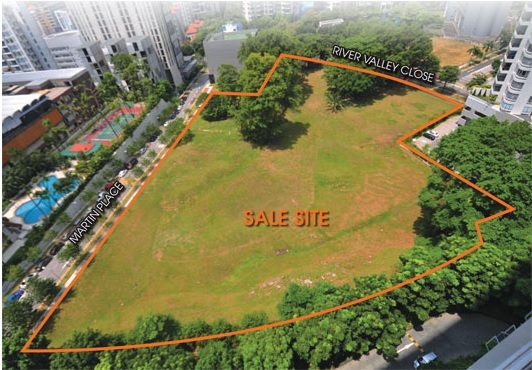 A prime residential site at Martin Place in River Valley has been launched for sale by public tender, according to the Urban Redevelopment Authority (URA). Released under the confirmed list of the first half 2016 Government Land Sales (GLS) Programme, the approximately 171,535 sq ft site has a maximum gross floor area of 480,307 sq ft. It could potentially yield about 450 condo units. The 99-year leasehold site is located close to the future Great World MRT station on the Thomson-East Coast Line. Nearby condominiums include Martin Place Residences, Rivergate and Martin 38. Desmond Sim, Head of CBRE Research in SEA, said: “This is a site that is expected to draw much interest due to its prime location. The last time a site was made available in the vicinity was back in March 2011 at Robertson Quay ($938 psf ppr). In addition, the last site awarded in District 9 was the Mount Sophia site back in September 2013 ($1,157 psf ppr). The tender for the land parcel will close on 28 June 2016, said the URA.